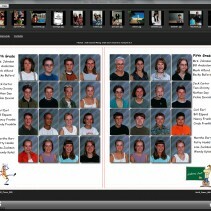 PLS worked with Interstate Studios to develop their yearbook program. This provided automatic and semi-automatic page layout of class pages and full page editing / layout tools. Uploading over TCP-IP to Interstate’s servers. PLS also reworked their production system to convert incoming jobs to CMYK color space and convert the books to PDF format in preparation for final printing.